In the future, society will be divided into a strict class structure. The undesireables known as Subgrades will not be allowed to hold jobs. They will not be allowed to marry or have children. Their basest desires must be satisfied with a futuristic concept known as…whores! To be caught outside of the futuristic structure where the whores are kept known as a House of Pleasure means certain death! Police suspecting a Subgrade of cavorting illegally with a woman will demand to see his junk to make sure it’s not suspiciously engorged! It goes without saying that this new world we all have to look forward to is a paradise! These restrictions on the class of people most prone to breaking them (young, unemployed, horny, single guys) inevitably leads to zero crime! It’s true! David Carradine even says so! 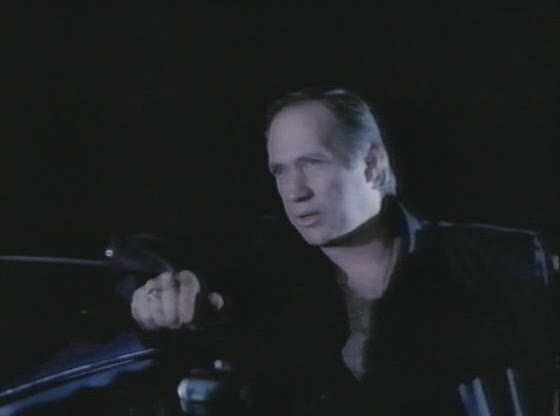 Carradine is in fine form during this cheap sci-fi phase of his career (see also Warlords, Dune Warriors, Karate Cop) as the enigmatic Jason, a cigar chomping, suit wearing guy who recruits Bone and Helen to pull off a heist for him. Bone is a guy who was just fired from his job which means he’s busted back down to Subgrade. He hangs out with a couple of his loser Subgrade friends including Creon (Michael Shaner, the serial killer from The Expert) and J.D. Helen (Sherilyn Fenn in a pre-Twin Peaks role) is a whore who catches Bone’s eye. After beating Creon at some futurisitc pool game (the balls looked different) and fending off his advances, Helen hooks up with Bone and begins an illegal love affair with him. Jason appears and offers to help them escape their city (Soleil) if they’ll just steal a computer disc with some information on it for him. They do this and immediately become Soleil’s most wanted criminals. When they meet with Jason to find out about their escape, he explains that they need to pull off yet another job for him and then they can go to the rival city that Soleil is currently at war with. In the first twist of the movie that comes as a surprise only to a Subgrade named Bone, Jason turns out to be one of the head cops! He explains that since the cops are so freaking great, there’s no crime in Soleil anymore so he has to create crime! And Bone and Helen are his greatest creations to date! As dumb as that is, even dumber is that he willingly put himself in harm’s way so that he could explain it! In the meantime, Creon’s grudge against Bone and Helen has really blossomed and it isn’t long before Jason approaches him with an offer for vengeance! Bone and Helen, having escaped Jason, hook up with their old military pilot buddy Alexi and cook up a plot to steal a helicopter and fly to Soleil’s mortal enemy and seek sanctuary there. But first, Bone and Helen are going to pull one last job! This movie must have set a record for one last jobs! Thankfully, this particular one last job is unlike anything you’ve ever seen. Except in a really cheap, cruddy, sci-fi movie. When I tell you it takes place inside a cryogenic facility, you immediately have an image in your mind of what this futuristic tech must look like. Erase that image immediately. There’s three or four customers and they’re just standing up inside plastic tubes with a little lighted collar on. The future is decidedly low budget and low effort. Finally, our heroes fly to freedom! Or do they? I suppose that if you’re a Subgrade who hasn’t gotten laid regulary, you would be shocked at the shock ending they lay on us, but I would have been shocked if it had ended any other way. Landing in the territory of Soleil’s enemy, all they find is a decayed airfield with skeletons lying all over. But who is that waiting in the hangar? Holy crud! There’s a guy in there that looks exactly like Jason! Oh wait, it is Jason. For the second time in the movie Jason reveals his secret agenda. This time he explains for no reason except so that the audience will know what the point of everything was that Soleil defeated the enemey 20 or 30 years ago, but they needed to pretend the enemey was still around to keep the military budget up. Then he started complaining about how radiation doesn’t stay where you want it, that the stolen computer disc would ensure that he wouldn’t be the next criminal of the month and that by telling everyone that Bone and Helen had gotten away and might someday come back to attack them, things would continue to be really great in Soleil. Really Jason, it would have probably been better if you left all that unexplained and just kept the audience guessing. You don’t need to be a pent up Subgrade to tell that Crime Zone is comfortably sucky. Combining no new twists with one of those dystopias that don’t make any sense (what was the entire point of the whole Subgrade system? And how did that eliminate crime instead of make it skyrocket? Especially since everyone lived in squalor much worse than anything most people live in today?) 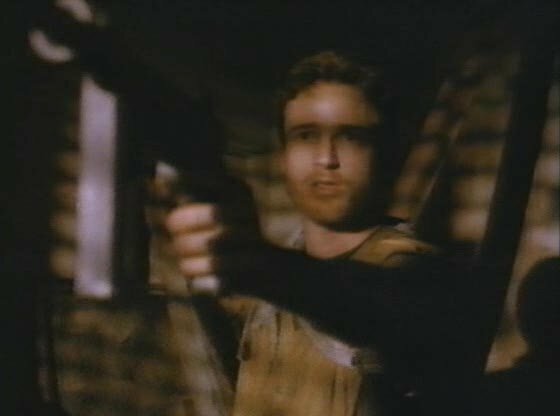 with the expected production values of a Roger Corman produced movie, Crime Zone will sparodically make you wince with its non-existent peformance by Bone and over-the-top mugging by Creon. Mostly though, it will bore you with its trash-strewn set decorating, cops decked out in umpire chest protectors, and all sorts of boring scenes of Creon, Bone, and Helen arguing with each other. Say what you want about the onerous life of a Subgrade, but at least he never had to watch this. Brilliant. 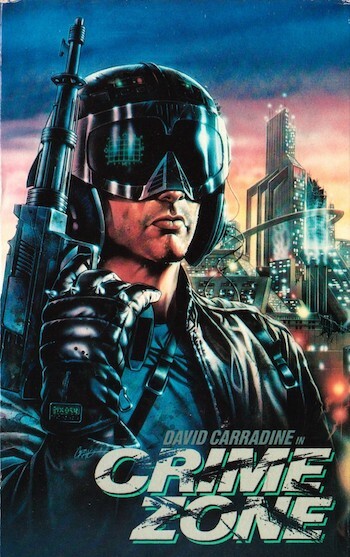 One may think you are shaming Carradine by exposing his horrible movie resume, but to be honest there is nothing you can do or say that would be more embarrasing than the way he croaked.